NAKIVO Blog > Data Protection > Backup Technologies > What Is Incremental Backup? The amount of data that businesses have to deal with today forces them to look for faster working and more reliable backup software. With so much business-critical data needing to be backed up on a regular basis, it is essential to use technologies that can help save space, time, and money, all while ensuring the desired level of data protection. Aiming to meet these growing market needs, backup solution providers started modifying the very mechanism of creating backups while improving their software products with new features. That's how various new backup types emerged. Today, the backup mechanism that a company chooses to apply depends on its particular needs, e.g., the amount of data to be protected, the degree of reliability required, the storage space available, etc. For small and mid-sized companies with a virtual infrastructure, however, incremental backups seem to be the best choice, offering reliable VM protection, easy scaling, and significant storage savings (which is often the decisive factor). Let’s consider incremental backup in more detail. Unlike full backups, where all data is copied to the backup repository with every backup job, incremental backups offer a much leaner approach. A full backup of the system is performed only once. After that, every job copies only the data that has changed since the previous job was run (an “increment”). The resulting storage savings are significant and grow along with your infrastructure. The process will be repeated until the next full backup. Because it has the full backup and all the increments since, the backup software can always restore a VM to the necessary recovery point. With further development of backup software, various types of incremental backup have emerged. The regular incremental backup is the most straightforward type of incremental backup, and the one illustrated above. The backup software backs up only the data changed since the most recent backup job. To improve reliability, it is recommended to make periodic full backups (usually once a week). The forever-incremental scheme is similar to the regular incremental one, but in this case a full backup is made only once, rather than periodically. After the initial full backup, the software copies only increments, which helps save storage space. In the reverse incremental scheme, a full backup is synthetically created after each incremental backup job. This way you always have a synthetic full backup to recover from. After a full backup is synthesized, the increment will be stored in the backup chain preceding the synthetic full backup. In the forever forward incremental scheme, the software modifies the first full backup when the number of recovery points exceeds the retention policy. For example, if you want to save only 10 recovery points for your VM, when the eleventh recovery point is created, the backup software will incorporate the first recovery point into the full backup. Multilevel incremental backups require a more elaborate approach. In this case, backups are assigned different levels. The full backup is level 0 and the incremental backups are assigned levels 1, 2, 3, etc. (the amount of levels will vary according to the size and complexity of the infrastructure). Each level contains only the changes made since the last n-1 level backup. If you make a level-1 backup on Monday and then again on Thursday, the Thursday backup will contain the changes made since Monday (even though backups of other levels were made on Tuesday and Wednesday). Multilevel backups allow for faster recovery, as fewer increments are needed to "assemble" the necessary recovery point, but require more effort, storage, and attention. In our example, if a crash were to happen on Friday, we would need only the full (level 0) backup, and the Monday, Thursday and Friday increments to restore the VM. Download our free White Paper to learn about other ways of ensuring faster recovery and reducing your RTO. Incremental backups can be further classified based on the level at which data changes are tracked. In file-level incremental backups, if any file has been added or changed, the backup software copies this entire file to the backup repository. This type of incremental backup, however, has its drawbacks. If the added/changed file is large, the resulting backup will also be large, extending the backup job duration and requiring more storage space. In block-level incremental backups, the backup software identifies the data blocks that have been changed since the most recent backup job and copies them to the backup repository. Block-level tracking allows a more granular approach compared to backing up entire files, as in file-level incremental backup. In byte-level incremental backups, the backup software identifies individual bytes that have been changed since the most recent backup job and copies them into the repository, allowing backups of an even smaller size. Less storage space – full and differential backups consume a lot of space in your storage, forcing you to expand it. Incremental backups are much more storage-friendly. However, sometimes the backup software will need to go through all increments to recover a VM, which may have a negative impact on recovery speed. How do you get these benefits of incremental backups for your virtual environment and make sure your recovery is as fast as possible? NAKIVO Backup & Replication – a modern backup solution – is the answer. To learn about 21 advantages of modern native backup solutions over legacy backup software, download this free White Paper. 1. The "Forever incremental" type (regular backup repository) – optimized for generic storage systems. NAKIVO Backup & Replication performs forever-incremental VM backups and stores data using the full synthetic mode of data storage, which results in multiple storage-, performance-, and recovery-related benefits. Once the initial full backup is made, all jobs are forever-incremental. Using the CBT and RCT technologies, the product tracks changed data blocks and stores only those blocks in the backup repository according to your preferred retention policy (up to 1,000 recovery points saved and rotated on a daily, weekly, monthly, and yearly basis). Every recovery point is, in essence, a number of references to data blocks that will need to be used to recreate the virtual machine as it was at a certain point in time. Therefore, the backup software doesn't need to go through every increment in the process of recovery or create a synthetic full backup after each incremental job. Instead, it just pulls the necessary data blocks together and recovers a VM within minutes. There are no duplicate data blocks in the repository thanks to the product’s deduplication functionality, and the unique data blocks are further compressed to take even less space. Swap files and partitions are skipped during VM backups for better performance. These techniques allow NAKIVO Backup & Replication to provide fast and reliable backups, while saving storage space. 2. The "Incremental with full backups" type (special backup repository) – provides improved reliability and has a special architecture optimized for efficient operation on deduplication appliances, such as NEC HYDRAstor, Quantum DXi, EMC Data Domain, HP StoreOnce, etc. 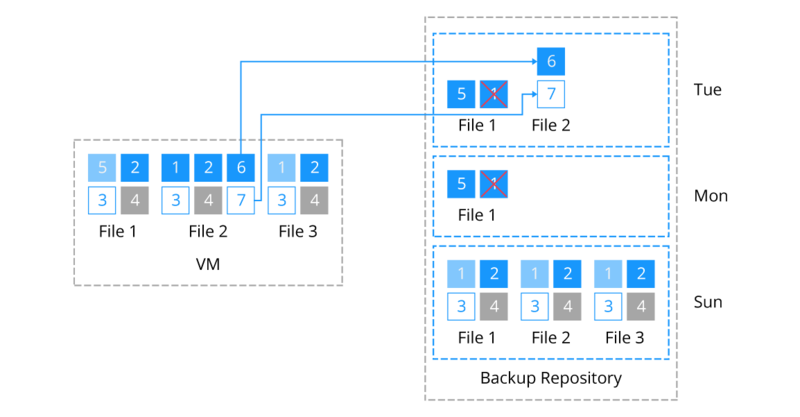 In this case, NAKIVO Backup & Replication performs not forever-incremental, but the so-called "incremental-with-full VM backups", storing chains consisting of periodic full backups and several increments between these full backups. The special backup repository has an improved file structure. All backed-up data blocks are arranged into a limited number of files for each VM: one full backup file and one additional file for each increment. During VM backup and recovery jobs, read/write operations are performed with a limited number of streams (i.e., one per VM). When the special backup repository is used, the proprietary VM backup deduplication and compression functionalities of NAKIVO Backup & Replication are turned off. Data deduplication is performed only by the deduplication appliance itself, preventing any possible conflicts. Each of the above repository types is easy to use, and the availability of both of them gives you flexibility in attaining your specific data protection goals. If you want to get even more benefits, install NAKIVO Backup & Replication directly on a NAS device (ASUSTOR, QNAP, Synology, and Western Digital devices are currently supported). The resulting combination will be a high-performance VM backup appliance that includes backup hardware, software, storage, deduplication, and backup-to-cloud (AWS or Azure) functionality in a single device. A VM backup appliance built in this way can help you offload your production server, protect your VM backups, and improve performance by skipping data transfers over the network – all while costing you up to 5X less than a purpose-built backup solution. Out of all the available backup types, incremental backup seems to offer the most benefits for companies with a growing virtual infrastructure. It ensures reliability and accessibility of VM backups, helps save storage space, offloads the network, and results in faster backup processes. While offering all these benefits, NAKIVO Backup & Replication addresses the main flaw of incremental backups (slower recovery) by using a full synthetic data storage mode with its forever-incremental backup system. For increased performance, consider installing NAKIVO Backup & Replication on a NAS device to create a DIY VM backup appliance, which can help you increase VM backup speed by up to 2X, protect your primary environment, and save storage space. Download the free trial of NAKIVO Backup & Replication to experience all these benefits for yourself, or request a Live Demo to see how the product works and ask any questions you might have.